Discussion in 'WW2 Forums/Forces Postal Service' started by Otto, Dec 17, 2017. 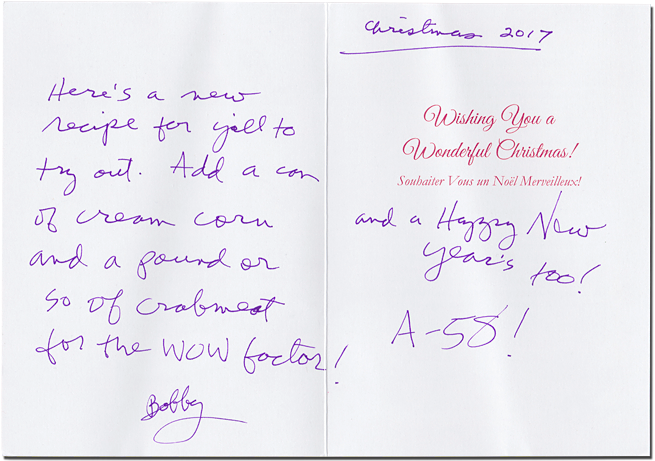 I checked the bunker mailbox yesterday and was pleased to discover that A-58 followed up from last years Christmas Card, providing us with another Holiday greeting and a delicious recipe, this time for Shrimp and Corn Soup. I'm a sucker for a tradition, and now that Bobby (A-58) repeated his Christmas Card/Creole recipe two years in a row, I'll be expecting the same holiday greeting come Christmas 2018.
gtblackwell, TD-Tommy776, The_Historian and 1 other person like this. Man I gotta quit drinking beer when writing out Christmas cards. My penmanship gets worse as it goes along! LRusso216, gtblackwell, TD-Tommy776 and 2 others like this. We can't all be as perfect as Gaines' immaculate penmanship. My own penmanship took a serious downturn many years ago when I broke my wrist, and it has never been the same since. On the upside, I've been told that my writing improves after downing a strong double IPA or two. For those that "like" my initial post, I do appreciate it, and now please go ahead and tip your hat to Bobby/A-58, as he's the only reason this thread exists. My writing is illegible, even to me. Good show, Bobby, with the card. Making the rest of us look bad. 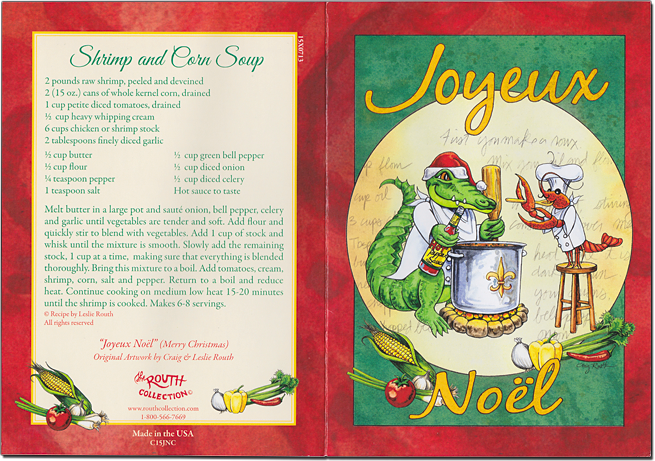 Great to read this Cajun French Christmas wish. It looks like it was done by Google translation. Skipper, most Americans speak Google French, myself included ....LOL My four years of it have long faded which is totally my fault. Bobby, your card brings back fond memories of living in Baton Rouge. . I remember going to a Jeep dealership with a friend, near New Orleans . While we were waiting on it'd repair we were in the showroom listening to the owner, G.N. Gonzales try to seell a Jeep is the purest Cajan I have ever heard. When done he ask us what he could do for us in near perfect Southern english. It was not two dialects but two different languages ! I also miss the food and Mardi Gras in Mamoo, never went to NO ! thanks for the recipie. I tried to send some gumbo file to Gordon one year but customs consficated it!! Joyeux Noel to all here and especially to Otto our host ! PS, Otto, thank you for the comment about my pensmanship, standard stuff in my field as lawsuits result in misintrepretaions but I have begun to develope tremors and find it increasingly difficult to maintain good skills. Some days better than others but if it appears to be deteriating it is not because of a good ale or cognac !!! To Honor the Fallen with Christmas. Bobby, you're making the rest of us look bad. Now you've gone and started a tradition! Anyway, Joyeux Noel to you, and the rest of the Rogues. My writing has pretty much stopped since my stroke. Even before it was terrible. My wife does the writing on cards, checks, etc. Well Lou, handwriting/penmanship is pretty much a dying art, so you better go ahead and learn to cook. Not much style and finesse needed in stirring up a pot of something good going on the stove you know.